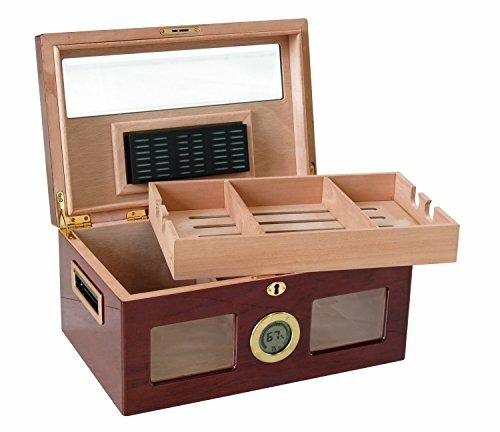 This 120 count humidor uses touches of beveled glass, a rich high gloss finish, inset brass side handles, and a large external DIGITAL hygrometer to bring out one of the most interesting appearances in a humidor. The Valencia is equipped with a removable tray with 2 spanish cedar dividers. Underneath the tray, additional storage with a spanish cedar divider. This humidor is absolutely gorgeous. Also offers a gold plate brass internal locking hinges, and gold lock & key set & a large oblong humidifier.